I went to New Orleans for Mardi Gras once,... ONCE. Cachinnating drunken men are seen making plangent and crude requests of equally ululating and intoxicated women, so that the latter will expose their breasts for brusque throws of beaded accoutrements by the former. The crowds are raucous, groping, puerile and ill-scented. At some points, you are unable to move either your arms or your feet, and are dragged, appendages pinned, to wherever the conventicle pulls. Frightening at best. I also visited the Lake Pontchtrain waterfront restaurants and first gormandized upon plates of andouille, jambalaya, and among renegade remoulade sauces. Carmines is a delight to enter. Walls are basic brick at sides, golden Tuscan wallpaper over shoulder, and dark pink fuscia paint everywhere else. Four forgettable rectangular rugs are assembled over foot-square Italian tiled flooring. A huge hanging gilded mirror Francophiles the dining area. A four-stool mahogany bar hugs the open kitchen, whose glow of stainless steel facades makes eyes twinkle in reflection. Black wrought iron flamboyant sculptures, candle wall sconces, overhead fans and incandescent glass lamps create just the right French-Italian-Spanish ambiance for grand Creole cuisine. Marbleized white-on-black tabletops are neatly littered with wine and water glasses, for BYOB pouring. The borough of Narberth has its first true destination restaurant. The restaurant has recently moved from its former commercial-street shebang in Havertown to its new more elegant digs in a residential area in neighborly Narberth. So side street parking is a necessity, and often difficult to find, unless you arrive by 6:30 p.m.
John Mims, the owner/chef, is most likely to be wearing a black T-shirt. His slick just-as-black hair is combed closely back. Muscular arms jutt out of the Ts high sleeves to wrists adorned by a mandatory watch on one and a bracelet on the other. Hes trimmed a slightly graying beard to rest easily upon a handsome otherwise unshaven face. His hands dont seem burdened by huge rings on each, as they tap on stainless steel cookware while he waits for a roux to thicken or a scallop to sizzle in its cornmeal breading. You may wish to begin with Crispy Sea Scallops ($7 small; $18 large), or Crawfish Spring Rolls ($8). The hefty scallops arrive coated and steaming, giving off apparent smoke signals directing you to halve them equally and to dunk either half into a concoction of black currant and balsamic reduction. Perfectly pearly interiors are moist and sweet. A taste of the first half without the sauce is pristine upon the tongue. That same tongue then curls in anticipation of cradling the other half embraced by the congealing purple dip. Front teeth bite at the scallop first, as it moves invariably backwards toward coddling molars mashing and splashing in the flavors of the immersed reduction. Swallow with sordid sanction, as balsamic blasts of wine make your mind wonder if you can fork another scallop as quickly as your cerebrum and lips require. The Crawfish Spring Roll is redolent of soy ginger sauce. Its skins color resembles that of an old cigar, crackling as you slice through it, toward its innards loaded with red crawfish chunks and golden stuffing. The ginger sauce adds a delayed flame to ones larynx as you ask anyone nearby to fill your water glass. If you adhere to the philosophy that your eyes must water and nose must run in order for a meal to be acceptable, then just keep on picking blackened entrées, spicy gumbos, spicier jambalaya and spiciest items culminating in anything soaked by cayenne crawfish stock. 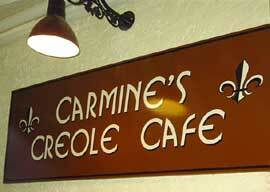 If youre more like me, head for Creole Chicken Andouille Fricassee ($15), or Deviled Jumbo Lump Crabmeat Cake ($21). I defy you to say youve ever had a tastier crab-clumped mélange. Its a fresh and devilishly flavorful mixture of meat from crab claws and chests. Its cup runneth over in red pepper beurre blanc sauciness upon a cloud of grilled spinach. Each mouthful is going to heaven. 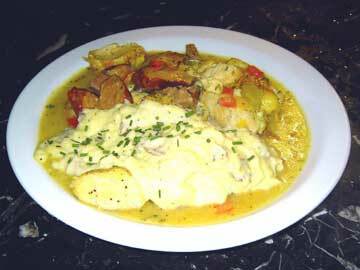 The Chicken Fricassee is slowly stewed chicken with thick-sliced andouille sausages, provided over roasted garlic mashed potatoes. Moist and mollifying, the chicken simply slides upon your palette. The sausage pieces are as garlicky as the potatoes beneath them, adding a ticklingly tardy tempo as the ingredients meld. Huge portions prevail. Another Main Course, The Pork Loin ($16), is filled with crawfish herb stuffing topped with crispy crawfish tails, grilled mushrooms and pan gravy over braised collard greens. Every morsel exceeds expectations but for the over-supply of nearly raw garliclovity (lots of halved cloves still white). 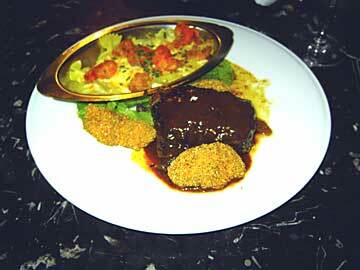 Finally, never miss the Short Ribs ($23) when available. Need I say more than theyre bountiful, boneless, succulent to a fault and surrounded by, of all things, fried oysters. I am proud and happy to have practiced law in Narberth for many years. What a joy to see it continue to grow culinarily. I will only avoid all this jazz on Mardi Gras.